Alan B. Miller Hall offers event space for weddings and/or receptions during the summer between May Commencement and August 1st, including the Brinkley Commons multipurpose room, Brinkley Commons atrium, and Fields courtyard. 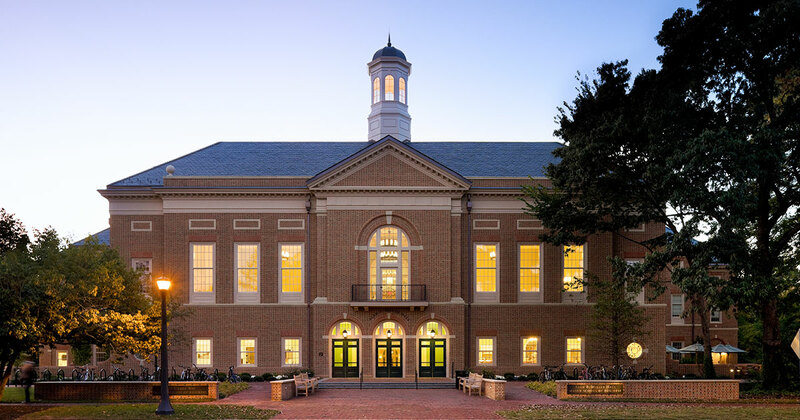 Weddings, wedding receptions, and wedding-related events held at Miller Hall are coordinated with the W&M Office of Conference Services. We will respond to your request within 10 business days. Miller Hall is available for weddings and receptions during the summer only. If the Bride or Groom, or a member of their immediate family (parent, sibling, spouse, or child), are affiliated with the College of William & Mary, please note that specific affiliation in the Additional Information section on this form. Please enter actual start time of event, set up time will be added later. Please enter actual end time of event, clean up time will be added later. All of the Miller Hall event space is reserved for weddings. Please indicates your preferred space for the reception.